Three people were trapped on the balcony of a burning building with firefighters trying to save them -- but all the ladders the first-responders had were too short. Volunteer firefighters in Landover Hills, Maryland saved three lives early Thursday by thinking on their feet and piecing together an escape route using two ladders. Firefighters responded about 12:30 a.m. to a fire on the top floor of an apartment building on the 4400 block of 68th Place, the Kentland Volunteer Fire Department said. Residents screamed from the fourth floor, trapped onto a balcony right next to where the fire had consumed a staircase. 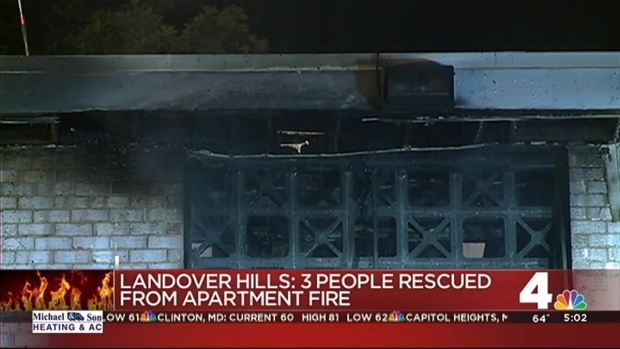 Three people had to be rescued from a Landover Hills apartment building after a fire broke out on the top floor. News4's Derrick Ward has more. The firefighters only were equipped with 14-foot, 24-foot and 28-foot ladders and no lifting device. Realizing this, the firefighters planted the 28-foot ladder on the ground, hooked it to the third floor and ascended with a 14-foot ladder in hand. A firefighter then stood in place as a connector between the two ladders and they lowered each resident down to safety. The firefighters thought on their feet, according to their training, Sgt. Cameron McKay said. "This was our plan B -- maybe even a few letters down from that," he said. It's all in a day's work, Firefighter Gaetano Leone said. "This is what we do. This is what we're trained for," he said.